Kathleen I love Big Bang Theory, and although I don't usually buy insignia clothing, I told a friend I really wanted a t-shirt from the show. She suggested googling the show name to see if I could find one. And I got it easily, quickly and it was exactly what I wanted. Sheldon's Biggest Fan I really liked the shirt. 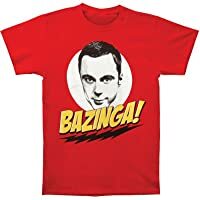 It made for a great Dr. Sheldon Cooper Halloween costume. As I'm well over 6' tall, I would've liked it to be a little bit longer, but otherwise the shirt is great. Beaut True to size. A little thin, but nice. Delio I Like very much of t-shirt.